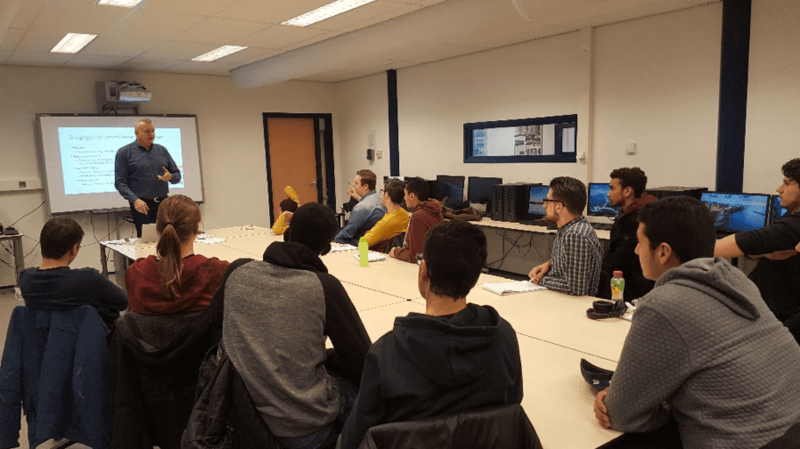 On 9 October 2018 the Cyberwerf-pilot was announced in which vocational level (mbo-) students assist Small & Medium Enterprises (SMEs) in defining cyber-related risks within the company. At this point scanning instruments, the first companies and the first batch of excellent students have been selected and a protocol has been created with guarantees for the student, the school, the data and the companies. Cyberwerf, the hybrid education project of the Security Field Lab on the ZKD Business Park, gives SMEs the opportunity to find out if their company is protected against cybercrime by offering easily accessible security scans. Many SMEs do not possess sufficient knowledge to properly assess the risks of cybercrime. This is why it is important that a ‘scan’ is used to detect possible vulnerabilities in the digital infrastructure. The excellent students that have been selected will be supervised in developing the service that allows them to detect risks in a fast and easy manner when visiting a company. Based on the advice, the SME can implement the right measures and, if necessary, call upon professional service providers. 100% security does not exist, nor does blind trust. That is why a protocol was composed to arrange the handling of confidential information and the methods. It was also recorded that the collected information will be deleted upon completion of the project. This is an important learning moment for the students: honest behaviour, being able to handle confidentiality and working ethically. These competences are a must in this field of work. Not only does the security scan offer advantages for SMEs in The Hague, but it is also a learning process for future cyber talent and that might be even more important. After the development of the security scan, the goal has been set to include the scan in the curriculum of IT-studies at ROC Mondriaan. Students from different IT studies will take this scan to entrepreneurs on the ZKD Business Park. This means that students will gain more practical experience. This way the curriculum stays up-to-date and future cyber talent will develop a clearer picture of the cybersecurity topic. The pilot is a first step to achieve goals that were set by partners regarding a better connection between education, the labour market and the smarter use of vocational level talent within the cybersecurity domain. The [email protected] offers the necessary cybersecurity knowledge, Cyberwerf allows students to apply their knowledge and train their advising skills. Partners of the Cyberwerf-project are the Economic Board The Hague, ZKD Business Park, The Hague Security Delta and Kenniscentrum Integrale Veiligheid (Knowledge Centre Integral Security) and ROC Mondriaan.